Nestled in North Carolina’s Blue Ridge Mountains, Asheville may attract youthful, sporty types, but it is steeped in the craft and music traditions of Appalachia. The restaurants here share the town’s rootsy energy. Foragers and small producers supply the ingredients for vegetable-driven, comforting meals at the town’s many farm-to-table restaurants. 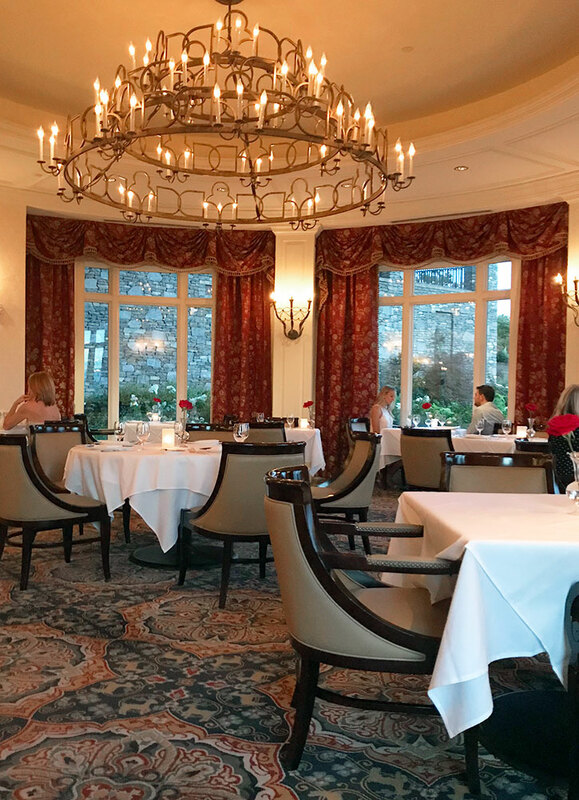 But given the area’s past as the Vanderbilt family’s playground, there are also a few temples of traditional dining serving upscale classics. 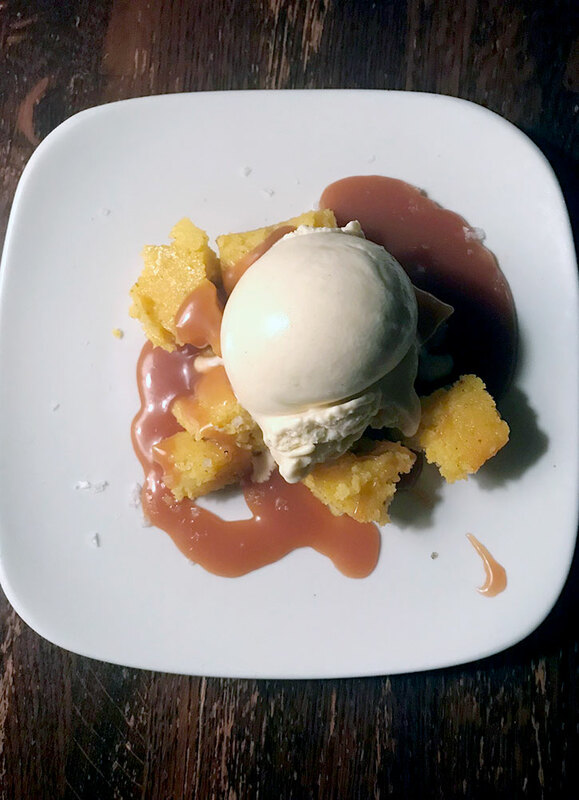 Chef Brian Canipelli, a master of Italian classics and innovations alike, offers Asheville’s best deal: an eight-course $48 prix fixe (the whole table must order it). 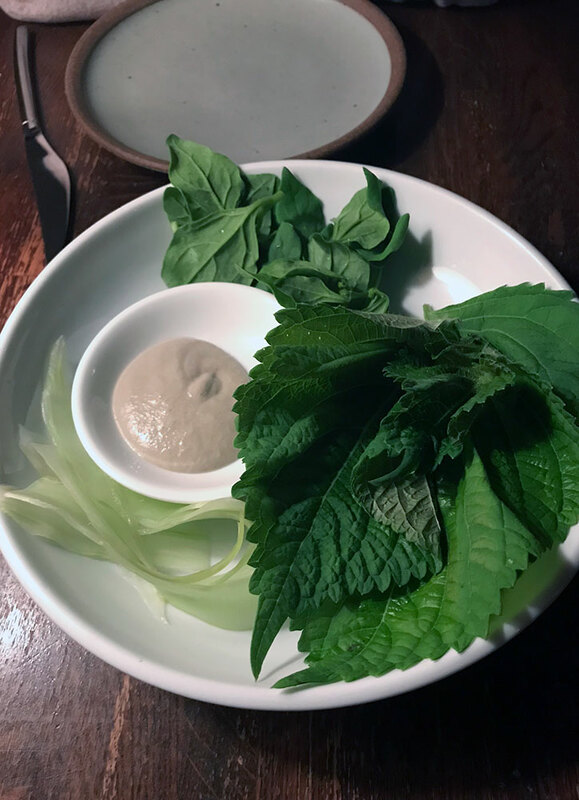 It starts with a forager’s grab bag of “odd plants”: spinachlike tetragonia (New Zealand spinach), ribbons of celtuce (a Chinese lettuce flavored like asparagus) and ruffly shiso served with a creamy anchovy dip. 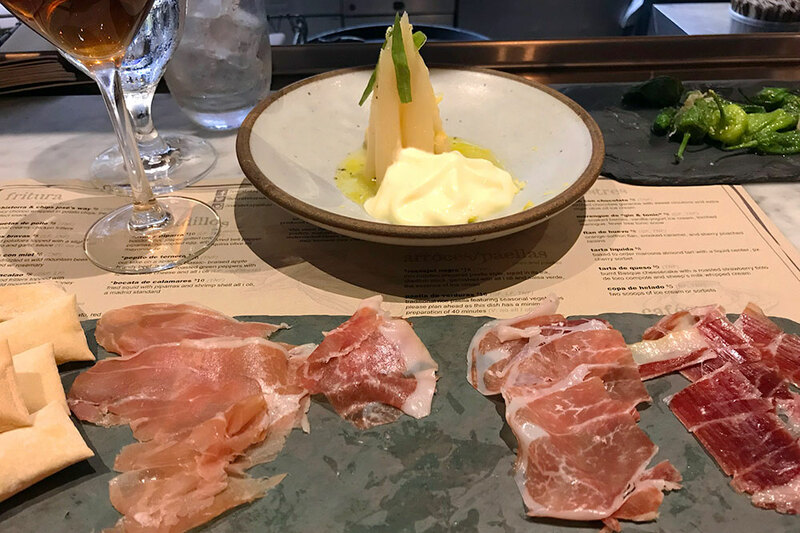 Paired with a salty, fizzy Sèt e Mèz rosato, made from Emilia-Romagna’s indigenous fortana grape, the course reflects Canipelli’s confidence and ability to spin farmstead finds into eye-opening, satisfying fare. In summer, there might be thick slices of heirloom tomatoes dolloped with aioli and strewn with thyme flowers, and locally grown Italian peppers pickled in sweet-sour agrodolce draped over gooey stracciatella cheese. Appalachia’s long, bumpy goose beans, blistered for bitter-sweetness, nearly upstage the lovely flounder with which they are served. The same can be said for the potatoes siding the suckling pig, their oven-brittle skins yielding to milky insides. Save room for other carbs: the wood-fired oven turns out chewy Roman-style pizzas, and you’d be hard-pressed to find better spaghetti carbonara, loaded with black pepper. For the finish, desserts like brown butter- and caramel-steeped polenta custard give Southern pies a run for their money. Dinner only. Reservations recommended. $110 with drinks. Smart and doting without being obsequious, the waiters are real pros at this exclusive dining room on the estate of America’s largest home. Their demeanor fits the old-school room, with its chandeliers and sweeping Blue Ridge views. The mood is set for a potent Vanderbilt Manhattan, served in a massive martini glass. As for other drinks, the Biltmore makes much of its own wine at the on-site winery. They’re okay, but there are better labels from more lauded wine regions on the reasonably priced list. A crisp Pouilly-Fuissé pairs with the king crab, melon and cucumber salad in a verdant dilled buttermilk sauce. 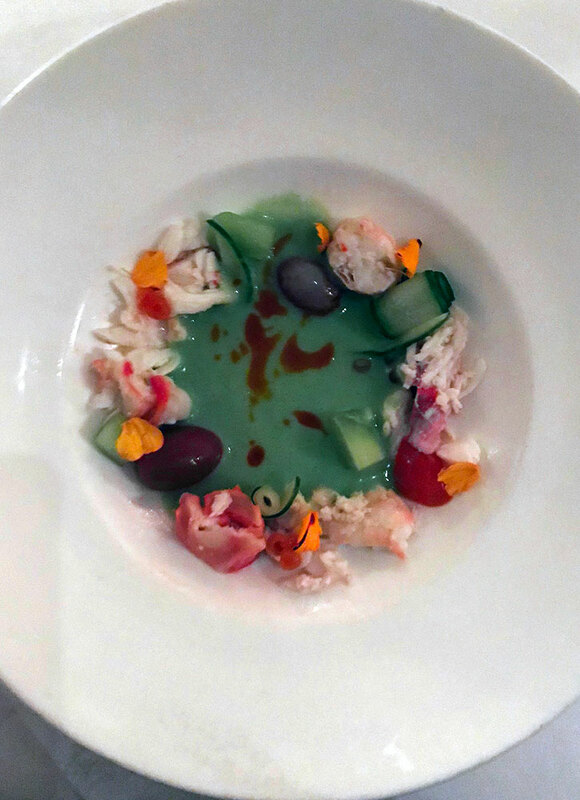 The dish is terrifically refreshing, but the $15 supplemental charge for the pleasure of eating this seafood delicacy is wearisome. Though the cherry jus blanketing the estate-grown short rib is dense with flavor, the beef is dry. Disappointing, too, is the cioppino. With enormous, fresh Carolina shrimp readily available, there’s no excuse for its imported crustaceans, especially when ladled over excellent Carolina Gold rice grits. The kitchen doesn’t make the same mistake with chicken. They source Poulet Rouge, a full-flavored, French breed from nearby Joyce Farms. The juicy breast is at one with mushrooms, which are tucked beneath its skin, infusing its jus, and piled atop the flaky strata next to it. Leave some Pinot Noir in your glass to wash down a cherry-loaded chocolate chess pie. Reservations required. Must be an inn guest or purchase a $65 estate day pass to dine here. $65 for three courses and $95 for five courses, not including drinks. 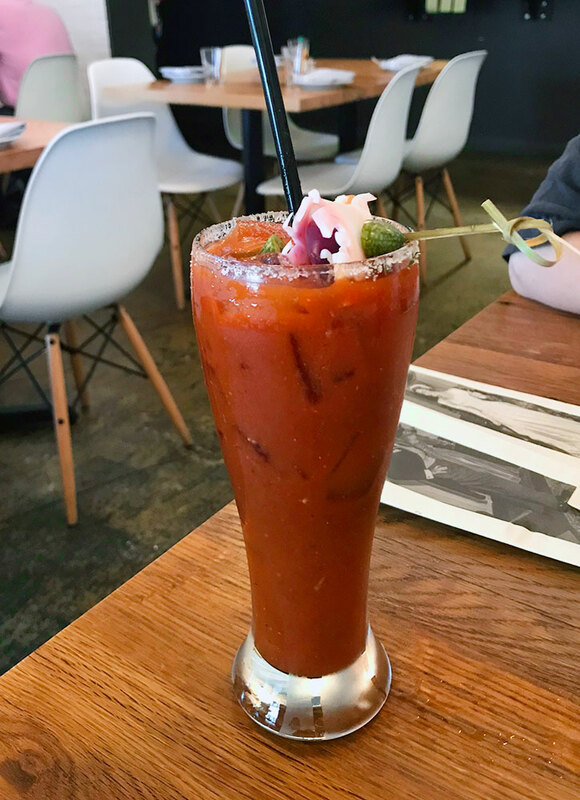 This France-meets-Appalachia bistro is great any time of day, but on Sunday afternoons it’s transcendent, beginning with the fantastic bloody mary topped with pickled cabbage. 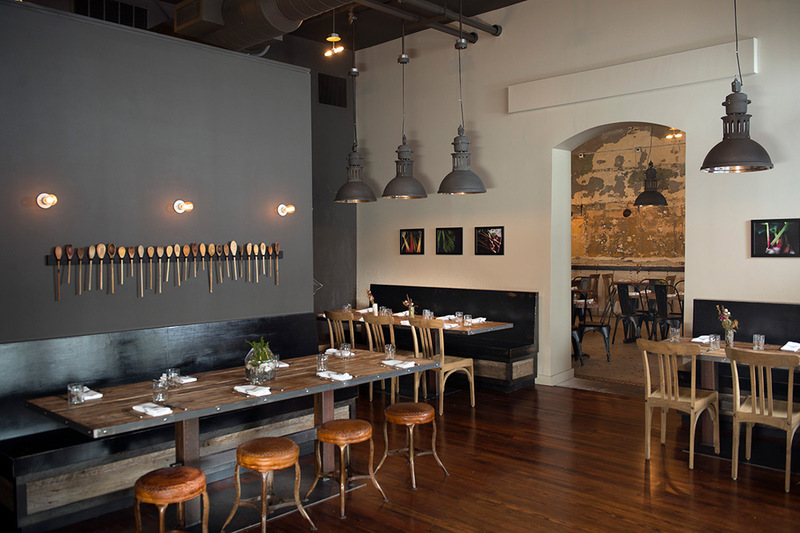 Owners Josiah and Shannon McGaughey, who started out with a pop-up and then a food truck at local Burial Brewery, have created a bright, art-filled space for showcasing Josiah’s inspired plates. Soft, plump and tinged with wood flavor, delicately smoked oysters come draped in remoulade and caviar, a luxurious way to launch the morning. McGaughey loads buttery caramelized onions atop fluffy smashed potatoes. 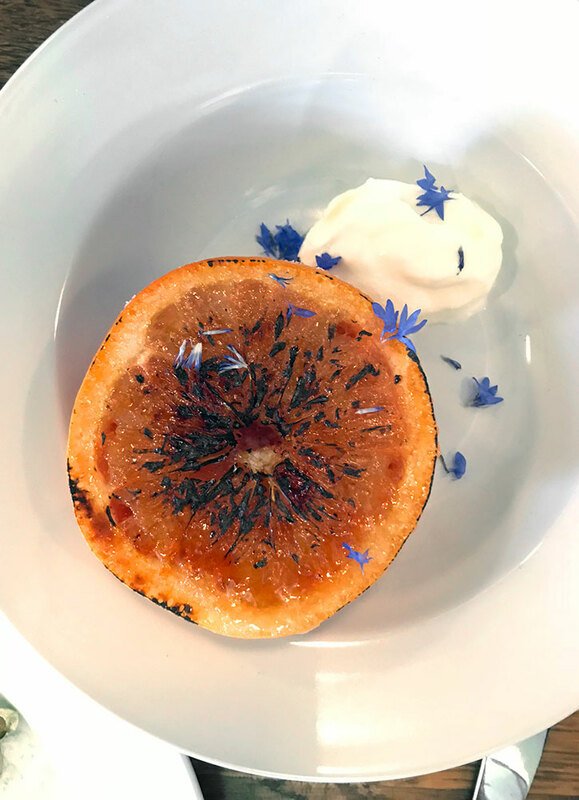 He uses spoonfuls of crème fraîche to amplify the pleasure of a honey-brûléed grapefruit. He treats custardy scrambled eggs and smoked salmon to a scrumptious dose of caper cream, and his garlicky house sausage has the loamy texture of the best boudin noir. But the standout is the soufflé omelette. Puffed up like egg foo young, stuffed to the gills with extravagant crab Newberg, and strewn with a meadowful of tiny herbs and flowers, it’s an automatic classic. Dinner and Sunday brunch only; closed Sunday evening and Mondays. Reservations recommended. $45 with drinks. For an unimpeded, al fresco view of the Blue Ridge Mountains and the golf course, ask for a table against the exterior wall on the covered stone terrace of this sprawling, historic inn. The namesake time of day, when classic cocktails precede a chophouse dinner, is glorious. 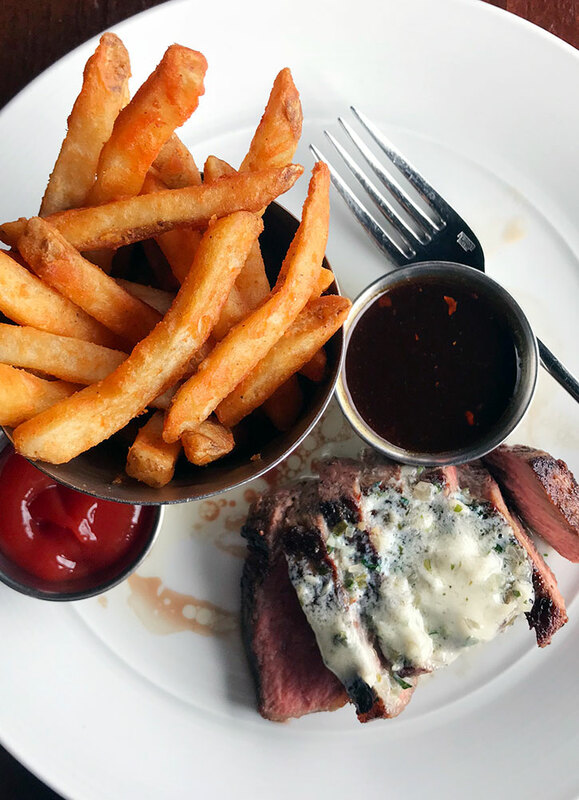 But lunchtime is delightful, too, for the kinds of throwback delectables that befit a place that once hosted the likes of Henry Ford and Eleanor Roosevelt. For dessert? Baked Alaska, of course. During the day, you can’t see the blue flame, but it’s still a thrill to feel its heat as your waiter brûlées that mountain of meringue at the table. The dessert darkens to brown as if by magic, and Carolina strawberries never tasted so sweet. Reservations recommended. $85 with drinks. At this casual spot with artfully fatigued walls and an open kitchen, chef John Fleer cooks food to remember. Appalachian liverwurst — a dense, intense spread that will blow your mind — is found on the “house cure” board along with excellent country pâté, among other things. Though the waiter might describe oysters Benton as Fleer’s version of Rockefeller, it’s no such thing. This is as original an oyster dish as they come: roasted bivalves enrobed in cornbread, country ham and greens. Hot sauce on the side completes a very Southern, very savory dish. Even more creative are the vegetables. For the extraordinary yellow squash “cassoulet,” Fleer treats the vegetable like a steakhouse might prime rib: scoring it, draping it in butter and wood-roasting it. Nettle pesto, smoked shiitakes and kale cooked with rosemary and chiles beef up the dish’s umami flavor. A vinaigrette-dressed herb and squash salad adds a balancing high tone. Pastry chef Kaley Laird matches Fleer’s delicious madness with her own. She reinvents the old hostess dish, ants on a log, swapping the raisins for plump currants and interpreting the peanut butter as a trio of mousse, ice cream and crumble atop chocolate cake. The celery? She pickles it in one last irresistible finishing touch. Closed Monday lunch and Tuesdays. Reservations recommended. $110 with drinks. This dark, plant-filled barroom at street level feels like a New Orleans watering hole. The dining room has a speakeasy vibe, hidden as it is on a mezzanine overlooking the cocktail crowd. Start with what they’re having: a boozy drink wrapped around a gigantic ice cube. The Seven Sinners — gin, two vermouths and local amaro — will have you feeling as naughty as its namesakes. On a menu made for grazing, the “mixed lettuces and weeds” exemplifies the practice, offering diners a medley to munch on: spinach, red oak, lamb’s quarters, amaranth, lemon cucumber, flower petals and whatever else the local harvest provides. Less virtuous but equally vibrant are the curls of fried chicken skin drizzled with chile honey, and melt-in-your-mouth tater tots made with bone marrow. Chef Graham House loves vegetables. The rough-chopped beef tartare, served on brioche with a creamy beef-herb vinaigrette, is topped with such a handsome cornucopia — radish, dill, chives — that it feels more like produce than protein. 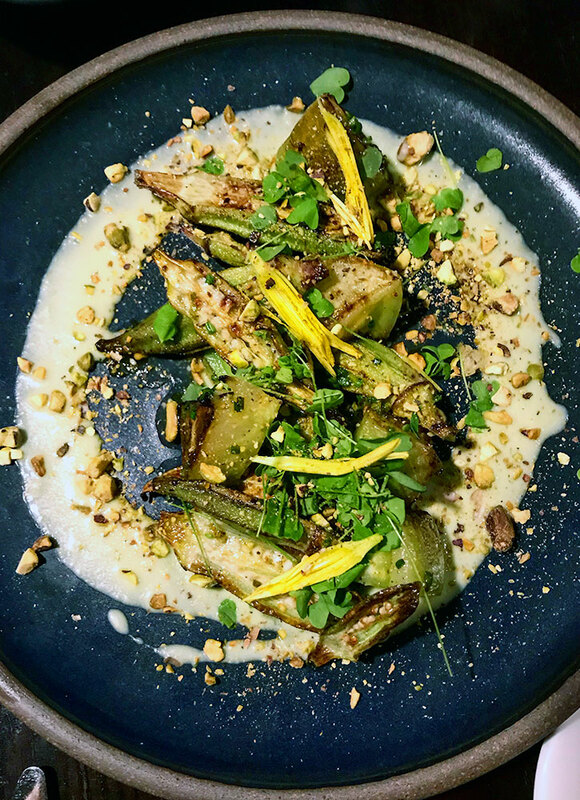 Charred okra, arranged like abstract art with tart green tomatoes and sorrel, salty pistachios and pretty daylily buds, is a garden-grown adventure. Even wilder are artichoke-like sunflower wedges. Hefty, meaty and paired with salty things (country ham, capers, celtuce oil) and sweet ones (green apple and Vidalia onion), they’re a radical meal all by themselves. 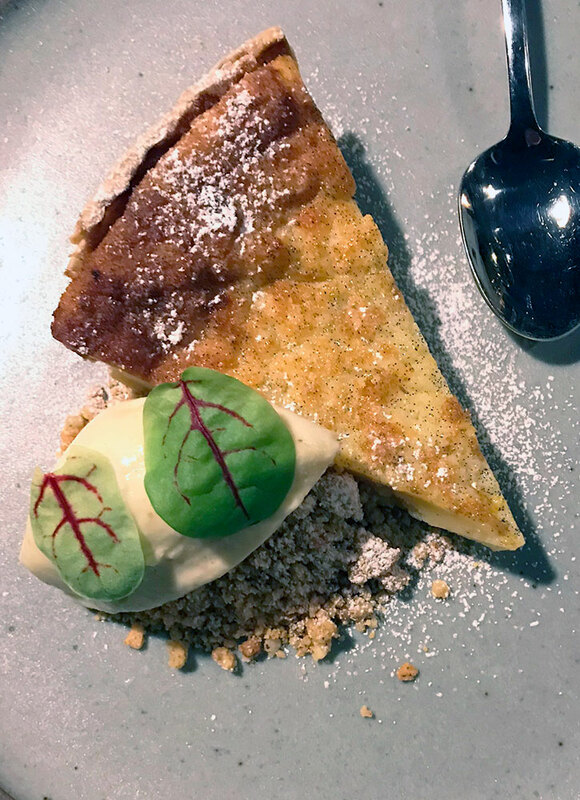 For dessert, buttermilk pie is mild-mannered in comparison. Reservations recommended. $75 with drinks. 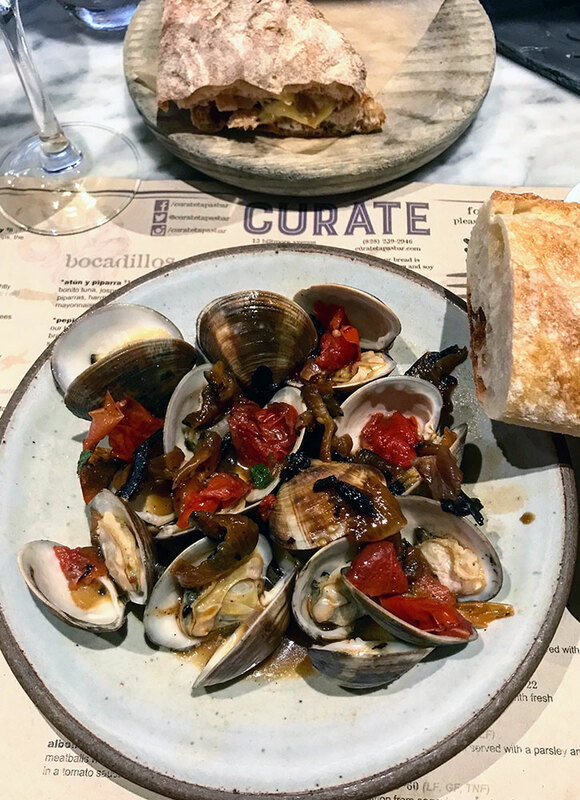 When you work for rock star Spanish chefs like José Andrés and Ferran Adrià, you learn Iberian cuisine. That is how chef Katie Button learned the ropes, and at her Asheville flagship, she lovingly executes enough authentic tapas to keep you in your seat for hours. Button’s husband, Félix Meana, has curated a list of Spanish wines, vermouths, sidras, sangrias and sherries as expansive as the food. Start your journey with the tabla de jamónes, each silky Spanish ham longer-aged, chewier and more flavorful than the next. A glass of La Garrocha Amontillado is as wondrously nutty as the cured pork. Fat spears of cured white asparagus are luscious and bittersweet, garnished with tarragon in lemon vinaigrette and ethereal housemade mayonnaise. The treatment is like a deconstructed béarnaise sauce, and boy, is it good. 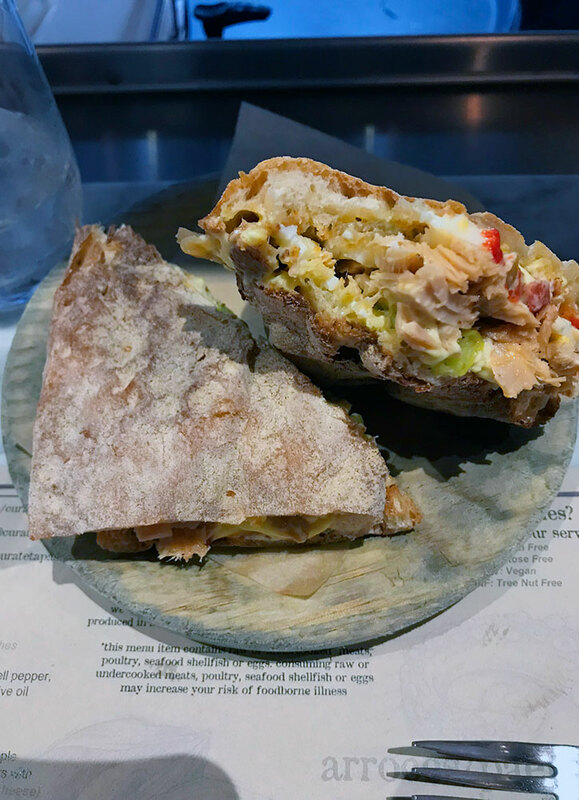 Mayo gets lavished, too, on the cured tuna and chile bocadillo, soaking deliciously into the air pockets of the sandwich’s crusty flatbread. Ham and sherry lace the slurp-worthy broth for oven-roasted Carolina clams. Unlike other places, where tortilla española is cooked ahead and sliced as needed, Button’s potato-and-onion omelette is made to order in individual cast-iron pans. It comes out oozing in the center, the best version of this dish on either side of the Atlantic. The almond tart is just as meltingly delicious for dessert. After that? It’s siesta time. Closed Mondays. Reservations recommended. $125 with drinks. 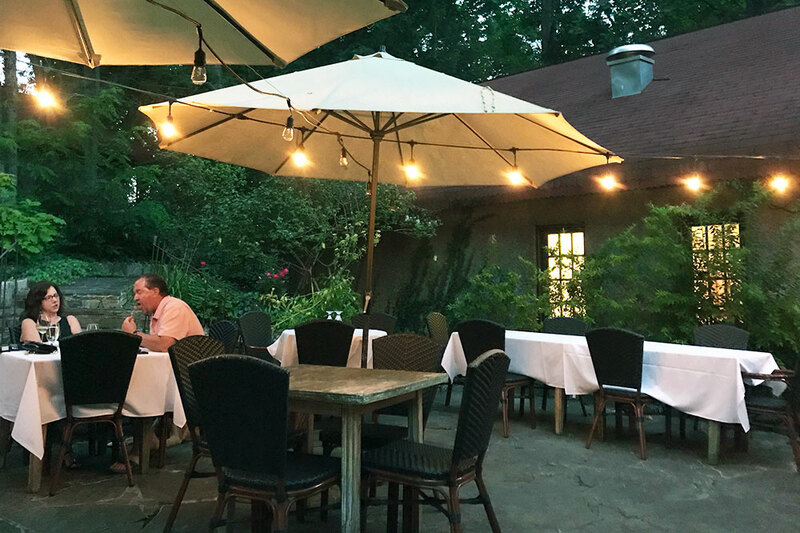 Set amid the trees next to the Grove Park Inn, the garden patio of this rustic Greek taverna in a converted textile mill is the perfect spot for a romantic meal. Aglow in twinkle lights and overseen by mellow staff, it’s the place to stretch your legs and enjoy an herbaceous G&T made with rosemary-infused tonic and barrel-aged gin. Though you might be let down when the saganaki, a dish of fried cheese, isn’t flamed tableside as it often is at Greek restaurants, phyllo-wrapped nuggets of herb-laced ground lamb make up for it, served with a thick, garlicky tzatziki. Many of the entrees come out of the wood-burning oven. 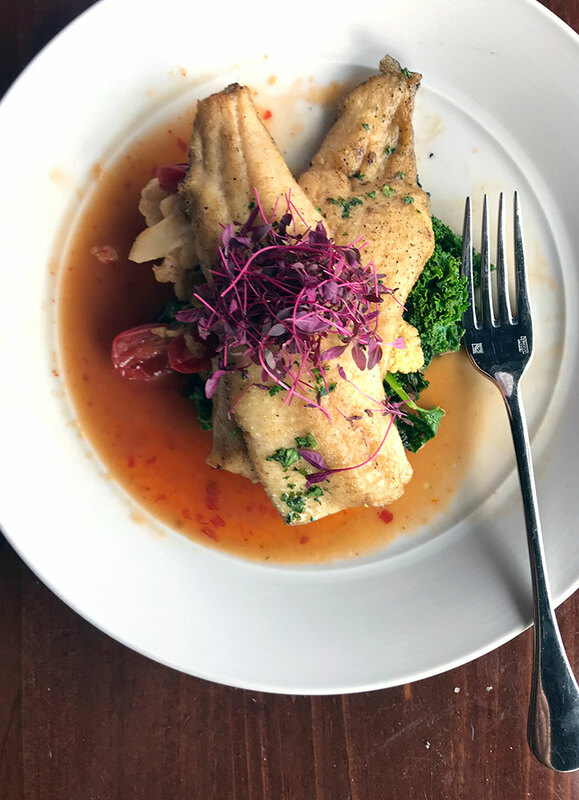 Specials might include whole bass, roasted with bright lunchbox peppers and accompanied by a salad of watercress and candylike Chioggia beets. The flavors are properly Mediterranean: clean, simple, pure. A crisp Assyrtiko wine goes perfectly with this fare. Dessert — for instance, a panna cotta served in a mason jar topped with a compote of the season’s fat blueberries — continues the straightforward pleasure. Closed Sunday night and Mondays. Reservations recommended. $100.